CAN I SAY SOMETHING? Imagine an airport. Can you think of an airport and feel what it is? An airport, a kaleidoscopic space, a mental multiplication, a neurological trampoline. And meanwhile, I listen to her. And whilst I am checking in, I see her. I see Roseline moving rhythmically, to the beat of a wish. A wish that maybe comes from the depths of a lush forest, the forest that you can see behind those glass panes, or a wish that comes from the heart, I don’t know. It’s been a long time now since I understand anything. Once again. The airport. When I was small and summer had arrived, I used to frequently visit the airport. There, I’d get out the Ford Fusion with my parents and head to the Arrivals to welcome our friends, who were coming from all over the world, ready to enjoy their holidays. It was always Arrivals. Then summer would be over and September would quickly arrive. The clouds would come back and we would once again climb back into the Ford Fusion to accompany my parents and say goodbye to the very same friends and relatives who had had a blast on the beach, under the scorching sun. Always Arrivals. Now, listen to me once again: I, we, did not catch many aeroplanes. Aeroplanes were for others, and the majority of the trips to the airport consisted of welcoming or saying goodbye to someone who was not me. Who was not me. So, when we would get back home, I would be filled with unease mixed with two spoonfuls of salt and frustration, digging into my intestines. Back inside the Ford Fusion, looking through the glass windows at the same landscape of brown mountains, my head would droop and the curtains of imagination would begin to flutter and I’d be presented with magical mysterious and unknown places that others were heading to. Others. At night, I’d lie under the Cocoon poster that hung in my room, and I’d wish with all my heart that I could transport myself inside that poster and have a life that’s worth talking about. I wanted to do all those things and more. From Cocoon to the airport. The unreachable airport that was a departure point, the origin of a code that needed deciphering. I didn’t mind waiting in the airport. I used to love having a drink at the airport. I wanted to be at the airport. I wanted to be at the airport all day long. That is why (because once again I don’t understand anything) that I started saying to myself that one day it would be me going to the airport and catching those aeroplanes. Do you get me? This time it would be me leaving to travel the world and visit the unexplored places and spaces that my mind could envision. One day it would be me leaving and catching a plane, and nobody would stop me. Nobody. 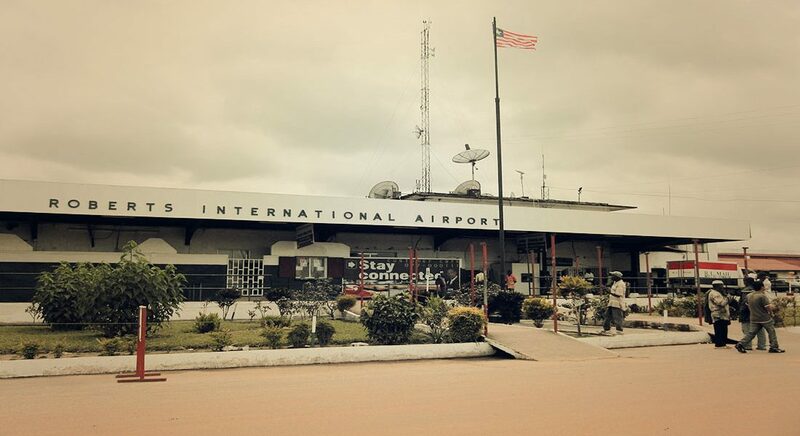 In Robertsfield, the airport of Liberia, Roseline, a Liberian woman who is in charge of protocol. She talks with rhythm and swing, I tell you, man, that girl is on fire. Roseline, an African woman who goes to the airport every day to meet and greet diplomats and officials from international organizations, speaks with rhythm, moving under a gaze that is somewhere between illumination and frustration and possibly somewhat teary, a shine that doesn’t quite shine. My ticket has just been handed over to me. Then my eyes, observing Roseline, somewhat (somewhat what…sad? cold? fake? ), make my mind think and then my lips say “You can come to the USA whenever you want, you already know that.” I say it rather unconvincingly, letting out a stream of clichés and typical expressions – empty promises. Because I don’t know whether she would come. But deep down, you know, I think she would. Because it’s been a long time now that I understand very little. And that’s why I think she would. Those wishes date back some time, a long time. At Christmas (it’s hot in Monrovia then), I had already felt (began to feel) that Roseline gazed longingly at how I would assemble a leather jacket and a scarf, getting ready for winter, clothing and attire from another world that she would not see but it was hinted at before her very eyes every day, like a bitter sweet that appeared before her, only to disappear again. We already know the daily ritual. Roseline would get out the Nissan Pathfinder, with us. Roseline would drag some case or another just like us, Roseline would check in with us, Roseline would hand over our passports to the airliner staff for us, Roseline would answer the bureaucratic questions for us, Roseline would crack jokes for us and Roseline would smile once again, for us. Next, she would help us fill in the immigration questionnaires and then start walking fast, fast and then slow, ever slower, until she would have to stop at a certain point. The world stopped here. A dream that doubts. doubts. Roseline could not advance any further. A policeman with a badge. Here it was time for the conveyor belt, cases slowly moving further away, followed by us, escorting our belongings, removing our watch, laptop, belt. Then I would turn around and see Roseline, timidly waving goodbye, smiling from the finishing line. You know, it was a good smile, kind but inevitably comparative, because we all compare each other on a daily basis and Roseline knew that we would all be leaving on an aeroplane except for her, who would go back home in that Nissan Pathfinder, the Ford Fusion. And that’s how it went, every day. Surprisingly at this point of departure, Roseline’s facial expression did not transmit a single drop of frustration, nor a trickle of envy, nor the slightest slither of anger, but rather quite the opposite. Roseline, the person in charge of protocol, would wave goodbye like a mother would with her children. And that gesture was simply great, simply unreachable for many. And then we would take off, we would fly. On my right, during the flight, I would not see Roseline, although I would often imagine her seated in the company leather seats, inquisitively pushing all the buttons on the back of the seat in front of her, somewhat in awe, searching for a movie, a song or whatever was there. And then we would land in a place that tastes of new, and Roseline would climb down, as we all do. And then she would see the sun, as we all see it.